So you thought the Skrull invasion was limited to the human-occupied sections of our planet? No, in case you've forgotten, Thor and his Asgardian brethren have recently taken up residence in the air above a small, sleepy Oklahoma town… and from the green skins' perspective that means they're just another earthbound civilization in need of demolition. In a two-pronged attack, the Skrulls are moving at once on both Asgard and Broxton, Oklahoma, and Thor can't be in two places at the same time. For this fight, he'll need to call in the reserves. Matt Fraction's connection between the Skrull empire and the rulers of Asgard is surprising and effective. He gives the aliens a sadistic, downright evil persona that's missing from many of the other Invasion tie-ins. The method in which the Skrulls deliver their warning to Thor and his people is shocking in its brutality and its simplicity, and that gives them a harsh edge that motivates the reader to see them utterly annihilated. Honestly, I've never had the time of day for Thor and his people, but in Fraction's hands I found myself sympathizing and pulling for Beta Ray Bill, of all people. I was especially impressed by the human element that Fraction added to this issue. When Thor summons a storm to help extinguish the fires ravaging Asgard, it would be easy to overlook the reaction of the common folks on the ground. Instead, he uses it to add a compelling extra layer to the proceedings, gives us a glimpse at a TV weatherman frantically announcing the sudden storm clouds to the city's population. He relates the startling composure of the city's populace, beaten into submission by the regular late-summer storms that personify life in the guts of tornado alley. Thor and Asgard's lives are intertwined with these people, and it's refreshing to see them treated as primary characters on the same level as the Gods themselves. Doug Braithwaite's accompanying artwork fluctuates between outstanding and humdrum. His greatest strength (and, clearly, his primary interest) is in architecture and scenery, but he has a hard time with humanity in general. When Fraction tasks him with a two-page spread of Asgard in flames, what he delivers is downright staggering. He captures the epic, towering beauty of the mythical city, counters it with the disturbing visage of flames in its heart and unnatural plumes of smoke floating through its streets. And then he plants it firmly in reality by adding the simple touch of a flock of frightened birds, scattered in the distance. But then, just one page later, Braithwaite is asked to impress us with Thor's transformation from human to God of Thunder, and he flat-out misses on every front. When the getting's good it's great, but when it's bad it's almost unbearable. 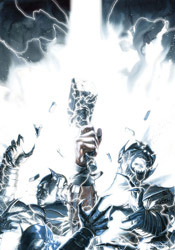 Secret Invasion: Thor is told in a style that's markedly different from the rest of the Invasion tie-ins, but that doesn't mean it doesn't fit. It's a much darker, more disturbing take on the central events, and that's an angle that the big picture sorely needed. Matt Fraction's writing this month is spot-on, and if he'd had a more consistent artistic pairing, I'd be recommending you buy this. Unfortunately, Doug Braithwaite's weak moments are more numerous than his strong ones. This is certainly worth borrowing if you can, and provides an excellent compliment to the main Secret Invasion limited series.